Read more below or schedule a visit and find out why yourself! “I have known Brett for over a year now and just recently completed the introductory 10 series under Brett’s guidance. When I started the series, I knew nothing about Rolfing. Knowing that, Brett structured each session to include an introduction to the current session and a heads-up for the upcoming one. That allowed me to enter each experience with more awareness and better prepare myself for the future work. Moreover, Brett created a safe, non-judgmental environment, which made it easy for me to share my sensations and thoughts. I remember Brett saying: “It’s ok to cry, just like it’s ok to laugh. We need all those experiences to be complete”. That was during one particular session when I had an immense emotional release and lay crying on the table for some time. The overall experience was holistic and adjusted to my individual needs. During our sessions we talked about diet, physical exercises, emotional health, spirituality and finding balance. I looked forward to each visit with Brett, and the opportunity to learn something new about myself. 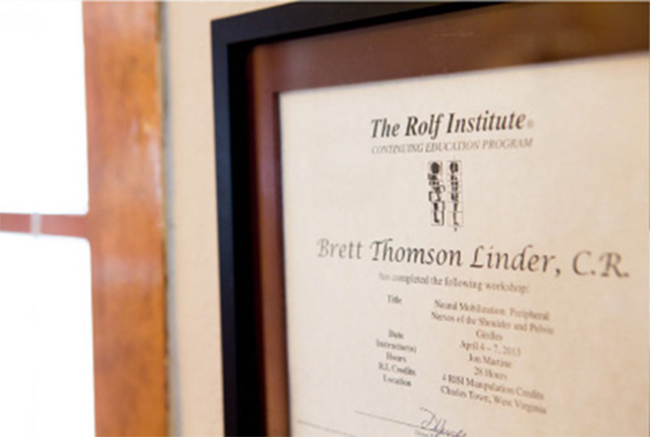 “I recently had the pleasure of working with Brett Linder, Certified Rolfer and Rolf Movement Practitioner. I was in a bad way when I turned to Brett for relief for what began as pain in the top of one foot that felt like a bone was out of place. Pain was spreading to my other foot, probably because I was favoring my injured foot and overusing the other, by the time I saw Brett for the first time. I was also beginning to have back pain because when ones feet are out of kilter, it can throw the back out of whack, too. I had seen my family doctor and a podiatrist for the problem but had gotten no relief. They were suggesting PT, which, from my own past experience, I knew could be a long process. Having such a depth of understanding of anatomy and physiology, Brett knew at what point I was paining and where to focus his work physically on my feet as a Rolf Movement Practitioner, but he did so much more than that–something I had never before understood. Brett helped me to create an image of what relaxation meant to me. As a healer, he instinctively knew that just exhorting me to “relax” would never do it for me! Learning that I was from Florida, Brett, asked if that meant I enjoyed the water. When I told him that I had spent every summer of my youth floating on the waves, he asked me to recall the feelings of those pleasant times and to remember how my feet felt as I bobbed ever so lightly up and down in the surf. It was when I was able to recreate that feeling of relaxation that Brett was able to really work with my feet. It was when I had a concept of what it meant to relax and I was able to recreate it for myself in practice at home as I had in only one session with Brett that any pain I had began to abate. Brett motivated me to work on stretching exercises every morning and, after only a few days, maybe even a week, I had no pain at all. I shall never be able to thank him enough. Having a therapist partner with me and gently talk me through the process restored my sense of well-being as well as the use of my feet. I don’t know if all Rolfers do this, but Brett does and it is very therapeutic! Frankly, I was wondering if the pain would return. I’m still doing the exercises Brett suggested I do because they feel good and help me to have confidence in the process and am happy to report that I have had absolutely no sign of the pain returning. 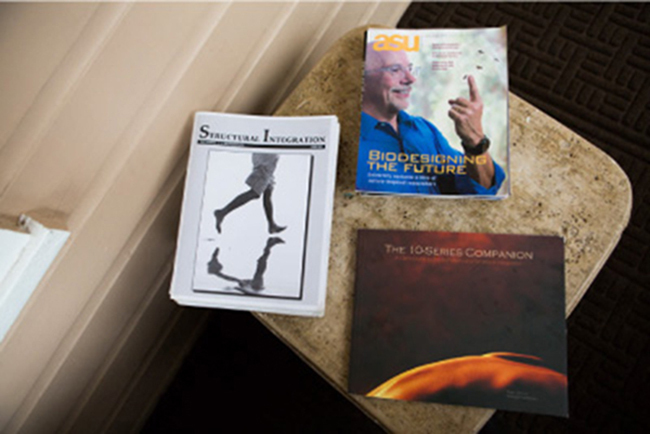 “Let me begin by saying that after I experienced rolfing, I will never go back to a typical massage. Rolfing is not just massage, it is structural integration, so it works on a much deeper level than any massage I’ve had in the past. People say that it hurts, I even heard one person say that it was like ripping the muscle from the bone. This isn’t true!! Instead, you feel sensations that you have never felt before. Say that Brett is working on your arm–you may feel a tingle in your arm that goes all the way up through your shoulder and into your back. It is the coolest thing ever. There are a couple of places that will be more sensitive for you. For me, this place was the transverse arch of my foot (the middle of my arch). So be it. Brett helps you work through the discomfort and then voila! You’re free of whatever had made it so tight in the first place. Rolfing is amazing. Here’s me: Initially, I went in because of terrible knee pain. I’ve been an athlete for all of my life, had a broken back, had knee surgery, and, for years, have worked either as a waitress or with children (think sitting in tiny chairs and lifting 40+ lbs. kiddos all day). I hurt daily. Usually, I would start my day with an anti-inflammatory. Then I would come home from work, take an Epsom salt bath, and massage my feet with arnica gel (a natural pain reliever). Here’s my experience: I went in for knee pain. Brett worked on my knee and then rolfed my legs. He rolfs one leg at a time, so in the middle of it, you get up and walk around to compare the before and after. The outcome was amazing!! One leg felt super tight and balled-up, while the other leg moved with such ease. I went back for a 10-series. A 10-series goes through different sections of your body, in 90 minute increments. So, one session is all legs; another is ribs, shoulders, arms and hips; another is the sides of your body; another is chest, arms and head; and another is the back of the body-from the calves up to the back. Think of the amount that can be accomplished in 90 minutes for each section of your body! The result: At the end of each session, I would stand up, walk around, and be completely astonished at how much lighter my body felt, and at the ease with which it moved. The best part is that I am still feeling the benefits. I no longer take an anti-inflammatory for breakfast and I haven’t taken an Epsom salt bath in a month. My posture is much more upright and each movement is very fluid. It is difficult to describe, but it seems as if my body has settled into itself. unbalanced posture. Additionally , in 2010 I played golf too much. I think that was the trigger to pull my trouble. able to stand or walk. really severe pain occurred on my lower back and right hip. little by little getting better. Anyway I could back to work in limited scale on that time. therapists again, but it didn’t help me. “Rolfing” is good to loose muscles. My guess was right like the arrow hit the center of target. I visited Anchorage and received three times session from Brett. He was very friendly and has lots of knowledge about human structure. After I’d got three sessions from him, the miracle was happened on me. me to try to walk so I tried to walk that night in Anchorage. Finally I found I was able to stand pretty much straight and walk ! I walked nearly 1 hour !!!!! It was one of the happiest moment in my life !! right over here, Brett Linder himself. As I detailed upon my arrival, the self-induced pain I was experiencing more than eclipsed my skepticism an low expectations of a solution. Any relief would be welcome! Based on [a friend’s] experience, and highly respected recommendation, as well as, your openness to allowing us access to witness the process overwhelmingly swayed my criticality. I can state emphatically that after just our one session I experienced a fluidity and range of motion I have not enjoyed in many many years! Yes, there was still associated pain (to be expected). What was totally Unexpected, and cause for this response…I am currently, pain free throughout the area in question! Thank-you! I anticipated some soreness or increase in pain as the meds wore off, and am floored that quite the opposite occurred. For someone who endures pain as a daily expectation, I am incredulous at it\’s absence! I look forward to working through the other areas we have discussed. “Rolfing in itself is amazing. It has significantly reduced my pain and has allowed me to regain mobility in my body that I thought was lost. I turned to Rolfing 3 years ago with a painful hip, and then used it as my primary modality with all of my new injuries that comes along with being an active Alaskan. Injuries to my hip, back, and shoulder resolved, but when I had a devastating life altering accident, not just any Rolfer would do. I sustained a head and neck injury in which I suffered from a poor active memory, visual problems, high fatigue, and dizziness. All of those symptoms ultimately led me to quit my job as a physical therapist assistant. After going to my doctor, physical therapy, vision therapy, and a Rolfer, I felt like I could get better, but no one was touching the source of my problem and I didn’t know how to explain it to them. I searched online for Rolfers in the Anchorage area with good credentials and success stories. That led me to Brett, and I am so thankful. After working with him, believe it or not, most days I feel “NORMAL”! I can hold down a part-time physical therapy assistant job without issues, I can see without special glasses, no difficulty with memory, and I don’t need to take daily naps. He was able to touch the source of my problem that no one else could.